Our flight landed at LAX late in the afternoon, so we just went straight to a nearby hotel for the night, looking forward to getting the bikes again after nearly 3 months without them. Morning rolled around, and we needed to find a way to get to Compton, the area where the shipping agents had their warehouse. After 2 trains and a bus, and a 1 klm walk, we found them. Hooked up the batteries, and with a bit of help from a jumper battery got them both running again, after their little rest. They really needed some TLC after the Russia/Mongolia/Stans leg, Lyn’s top box was falling apart, so we needed someone with aluminium welding skills to repair it, plus my pannier rack brace had broken at least a million times since Morocco, and need to be replaced. There is a guy in Santa Anna on the ADV Rider website that is in the bike industry, and is a welder, so we contacted him, and he said he would be pleased to help. We found our way to his shop, where he did the repairs we needed as soon as we got there, and did a terrific job. Thanks John, you don’t know how much of a help you are. If anyone is in the LA / Santa Anna area and needs some welding done, contact Truetorch Welding on 714-662-0112, John is a really nice guy, and knows his stuff, you won’t get a better job done anywhere else! It was dark when we left, so we booked into a motel in the area, before heading off to Phoenix the next day. 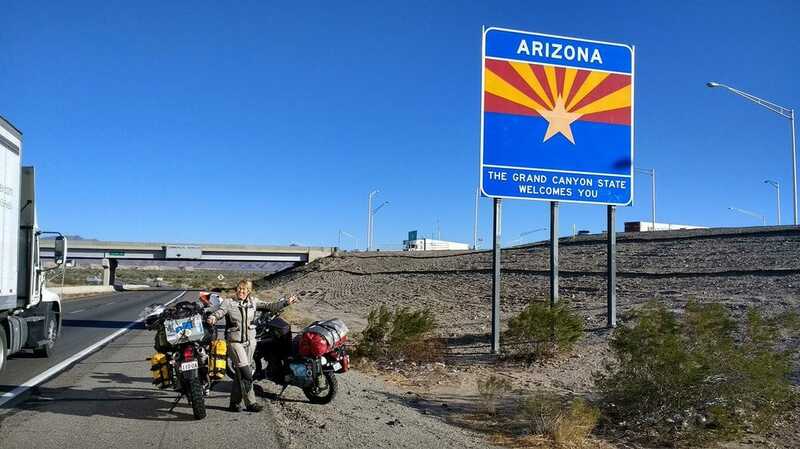 Ken and Carol Duval, friends and fellow bike travellers we knew from Australia, had contacted some other Aussies they knew in Phoenix, who were happy to host us for a few days while we carried out some of the necessary repairs on the bikes, so we headed for their place. It was a long day, and dark when we arrived, but they were waiting for us with a hot meal and a warm bed, great people. 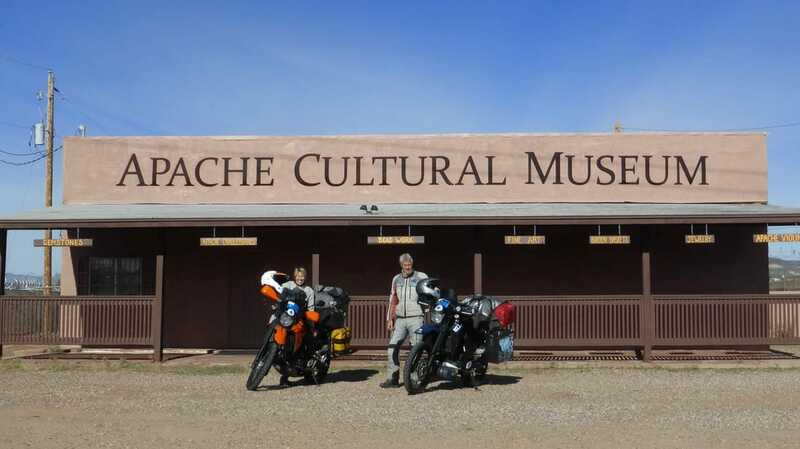 Bevan and Claire are also travellers, and host a lot of bikers and travellers from all over the world who are passing through. 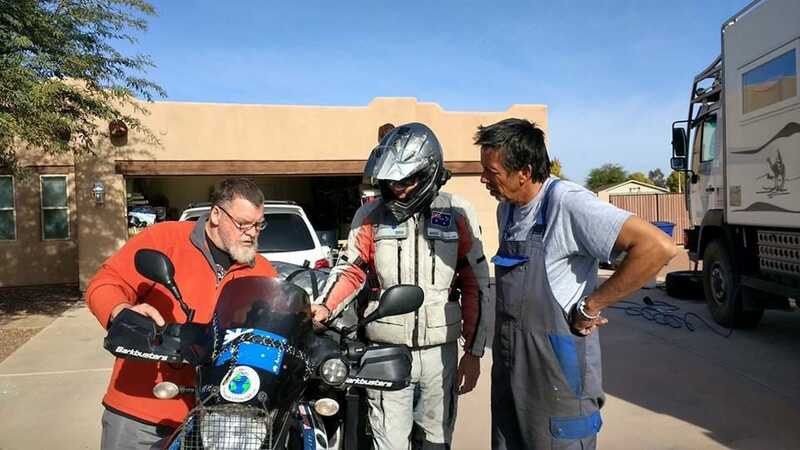 Bevan is a bike rider, but is now leaning towards truck based motor homes, and has a great workshop, with all the tools anyone could need to carry out repairs on the way, so it was the perfect place to get the bikes up to scratch again before we continued on with the trip. I needed to replace brake pads, wheel bearings, fork seals, and change oils, as well as a few other things, so Bevan and Claire’s hospitality was a godsend to us, I can’t thank them enough, terrific people. At this time of the year here (desert country) it is a bit cool, minimum temps around 4 degrees C, so early mornings weren’t an option. Some other friends of Bevan and Clare turned up, travellers in a MAN 4x4 truck. Hans and Karola have been travelling in their truck for about 4 years now, spending a full 12 months in North America. Really interesting talking to them about their travels. Bevan and Clare's house, with the garage/workshop out the front. We can't thank them enough for their hospitality and help. 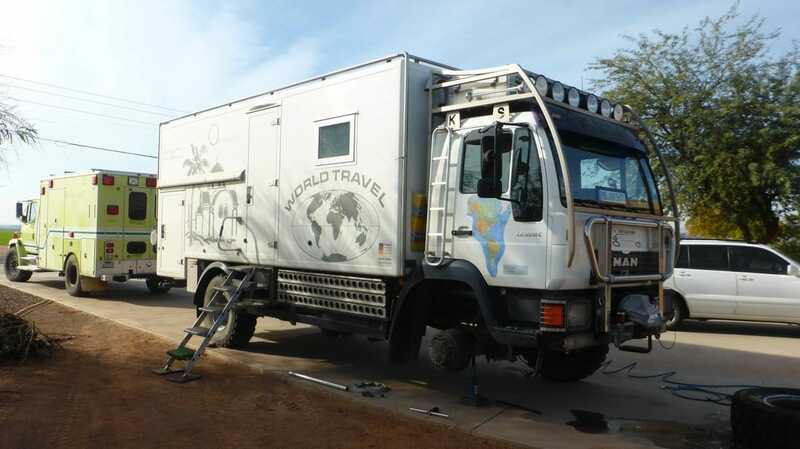 Hans and Karola's truck, looks like a great way to travel to me. We stopped here along the way, but it wasn't open. 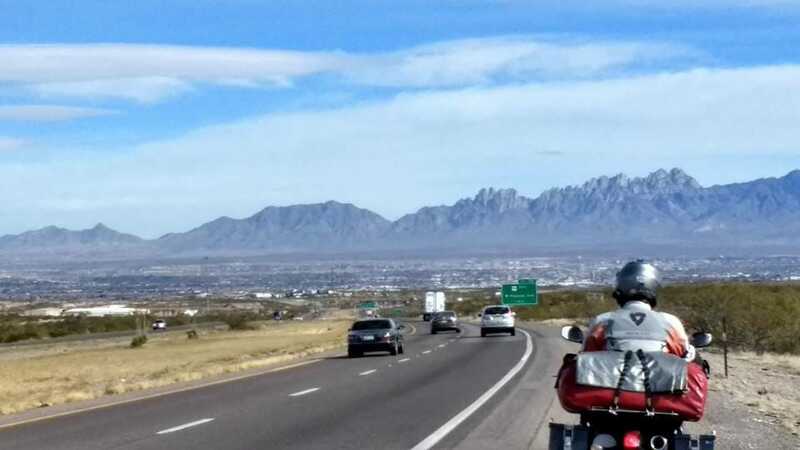 The time had come for us to move on, the bikes were ready, and we had to be in Corpus Christie in a week, so we took Bevans suggestion and headed off along I70 through Miami and Safford, rather than go along the I10 interstate, which would be boring freeway riding. Whilst it was cool, it was also fine, so it was a good ride, though through fairly flat country. 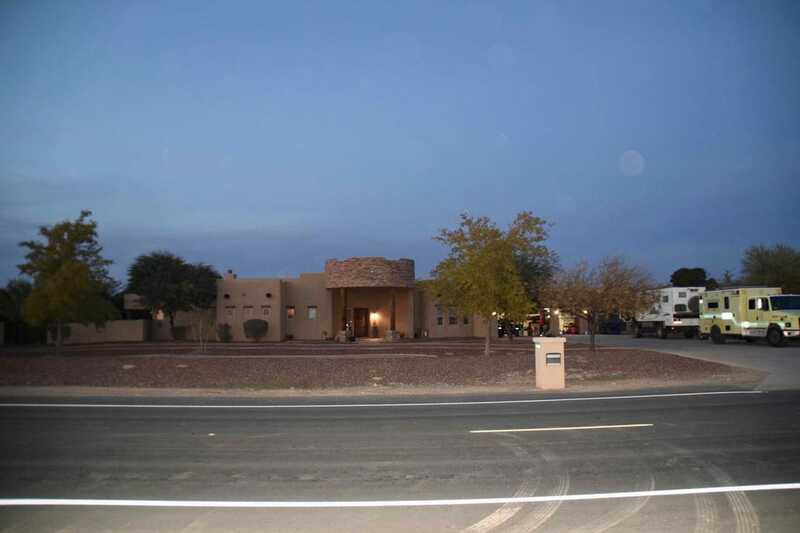 We ended up in Lordsburg, where we found a hotel for the night. Heater in the room was great, much needed.